Clay Ward is a freelance agent. As the owner of and principle agent for The Fortune Agency, a private concern founded by Clay Ward on East Hill Street in the Bahamian capitol, Nassau, Ward is usually the man to take the missions that come into this spy-for-hire organization. In some respects it is much like a detective agency but with the reputation that Ward has inside the global intelligence community, most of the jobs Fortune gets are connected to some government in one way or another. Ward's age is not mentioned but can be estimated to be in the late 30s based on the service in the military that is hinted at, a good ten years working for the CIA, and “many” years running his own company. He is described as quite tall with a large barrel chest and a weathered face, handsome but not exceptionally so. He has sparkling blue eyes and a quick smile. In one meeting with an old workmate, it is revealed that Ward had for many years the nickname of “Doc”. Since no medical knowledge is evident, it is possible it refers to a college degree. The activity that Ward did for Langley is not mentioned beyond very brief comments but whatever the mission was that ended his career with them, it did not go well as he was arrested and convicted of a crime and served fourteen months in Lompoc Prison in California while his superiors “got rich writing books”, to quote a former colleague of Ward. Leaving the States to start his own business, Ward chose the Bahamas because of its weather and its easy access to the Caribbean and flights to anywhere else he needed. His firm is a small one, consisting of him, a beautiful female agent named Hildy who doubles as the receptionist, and three male agents. Chester and Burke share an office with Hildy while the third, Roy, is more freelance. The Fortune Agency charges $10,000 a day plus expenses and, based on the lack of reaction he gets when he quotes those figures, the firm is well worth it. In the late 80's, TSR, a major paper-and-pencil role playing company which also owned a publishing business, added three spy series to complement one of their popular games, Top Secret. This game allowed players to play the part of secret agents involved in a wide variety of dangerous, vital missions to preserve, or destroy, governments, all within the safety of a living room or den. The first series was a return to the pulp era with Agent 13. 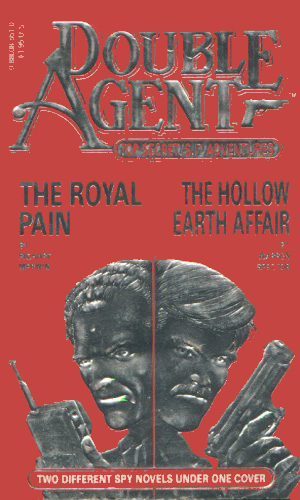 The second was an organization known as Agents of Fortune, this two-book series. The third was Sebastian Cord. 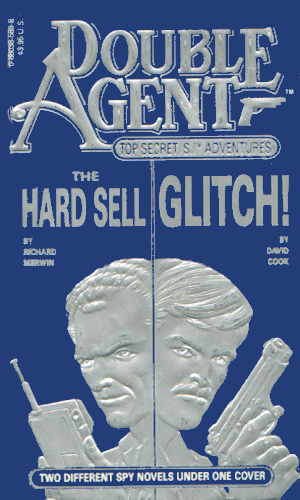 Agent 13 enjoyed several books on its own but the other two series were double-packed in a concept labels large on the cover, Double Agent, a play on words taking an espionage term and using it for two spy adventures. A European prince comes to the Fortune Agency for help in tracking the movements of his quite errant wife. While not pleased to be involved in domestic cases, Clay Ward agrees and soon finds out his wife has far greater plans than hanky-panky. The man who helped Clay Ward start his company needs help. As a legitimate arms dealer, he was upset that an Arab sheikh reneged on a purchase which he had handed over to fundamentalists. Ward agrees to help but soon finds himself up against fanatics planning to blow up as much of the West as they can. The two adventures chronicled about Clay Ward are just plain fun. They are not pretentious and they don't try to be something more than fun. Read them for a quick tale on a rainy afternoon. It is doubtful that the series did very well. The covers were incredibly plain with solid color and embossed, hard on the eyes images of spies holding weapons or instruments. And the concept of pushing the Double Agent name certainly gives a bad connotation. Even people who are not big spy-fi fans know that a double agent is usually a bad thing. That said, it is a shame because I really did like Ward and would have liked more about him and Hildy. The author did a good job.